Greater Manchester's shoppers could be using 5p compostable carrier bags as part of the region's new five-year environmental plan. 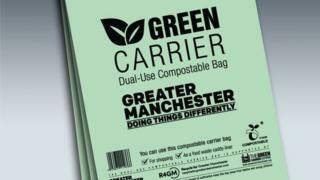 The Green Carrier plan will see Greater Manchester Combined Authority (GMCA) offer the bags to retailers for resale. Bio-degradable bags were first trialled by the Co-op in Oldham in 2018. Stockport Council leader Alex Ganotis said the idea would help the region as it faces "urgent and significant environmental challenges". Following the success of the Oldham pilot, which has also seen the bags rolled out to more than 1,400 of Co-op's 2,500 stores, the GMCA has backed the plan to offer them to all retailers across the region. The Local Democracy Reporting Service said retailers will be able to apply to the scheme for a supply of the bags, which break down naturally within 12 weeks under specified conditions. A 5p charge for them by the shops would see the scheme become cost-neutral, a spokesman said. The wider five-year plan also pledges to "drive down" single-use plastics by asking businesses, organisations and individuals to avoid them, encourage investment in the area's "environmental assets" and develop a clean air plan. Mr Ganotis, who holds the environmental portfolio for the GMCA, said it shows how Greater Manchester will meet its "environmental responsibilities, alongside securing our economic future and wellbeing".